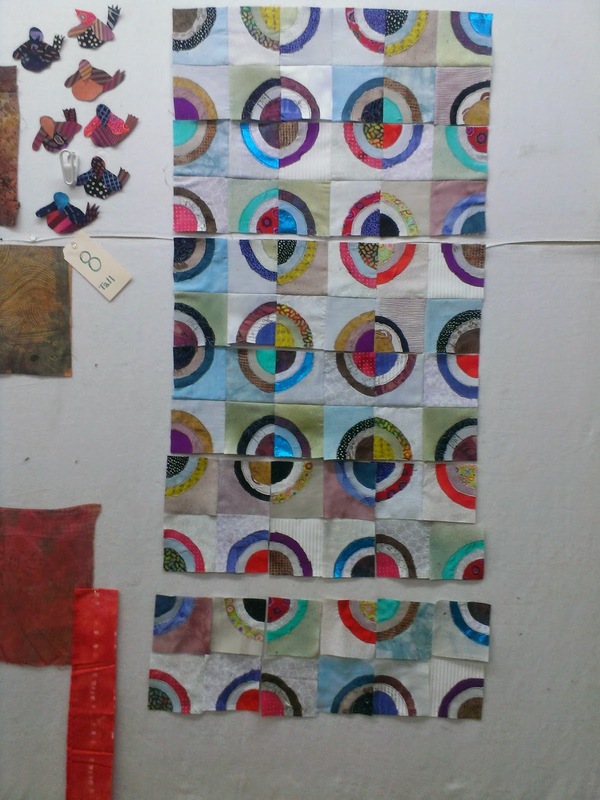 The period where I assemble a quilt on my design wall has always been a magical time for me. It is when the quilt makes the transition from theoretical to real. I've always identified it as the point where the quilt takes on or reveals its soul. Usually there have been many hours of work just getting it to this point and the reveal is often awe inspiring to me, its creator. It has been more than 5 years since my last project that involved Magic Time. Late last week I got to experience it and I was stunned. My frame of mind has not been at a very high level of late. 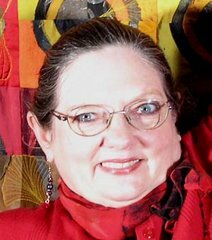 My mother just passed away, I am mid-process of handling breast cancer discovered last fall and we are awaiting selling our home so we can move across country to be near our children and grandchildren. The rising level of fear in my life has never been higher. I am, by nature, a very optimistic person. I usually assume the best, plan with an expectation of good things working out and see the positive. In my quieter moments doubts do arise but they are usually able to be set on a back burner for "wait and see". After stewing for months on how I would address this quilt, I finally decided that by simply starting with a technique that I could do in my sleep would get the ball rolling. I decided from the beginning that I would allow myself to declare this piece a failure, if necessary, and dove in. I deliberately added in some colors that I considered depressing and morose with the idea that I could acknowledge my current voice. I still don't know how I will move beyond the basic bulls-eye design to expand on my message. The theme of the piece is "ageing" and is to reflect on my view of the future. Yikes! Heck of a time to be addressing THAT subject. While I still don't know yet how I plan to build on the bulls-eye base, I do know I will be incorporating my newer printmaking skills and using free-motion stitching to add imagery and further my concept and message. As I began to stick my bulls-eye quadrants on the design was I noticed something. Despite my current emotional level, the piece was revealing a very happy optimistic feel. I continued to be amazed and felt like my inner core being lifted. I felt like what was being revealed was my core level of my soul and THAT core level was, as always, optimistic. I felt like all the garbage, all the chaos, all the confusion was blowing off and at the innermost energy level was me--optimistic, hopeful, wanting to engage. That is the magic of healing of art and the magic of Magic Time. My working title for this piece is "Terminally Optimistic." There are many more levels of imagery and stitching to come as well as a gray stripe to cross it. It is to be a part of am upcoming exhibition so more details will have to wait. I figured the foundation is very far away from the final look of this piece and therefore felt safe in sharing it.